Our TM1 is designed to work with our UH8 and can be used as a standalone time clock. The TM1-N is compatible with our UH1 and can be controlled from our central TouchPad. 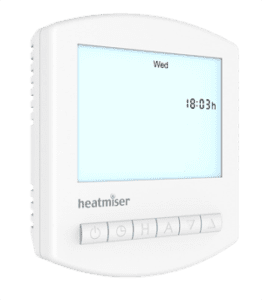 The Heatmiser TM1 is our 230v time clock, compatible with our 230v UH8 wiring centre or as a standalone time clock. The Heatmiser TM1-N is our 12v time clock, compatible with our UH1 and Central TouchPad. The Slimline Time clock series offer 4 switching times and can be operated in 5/2 day or 7 day mode. The TM1-N Slimline Time clock can be connected to the UH1 and TouchPad, enabling central control of the heating system. The lock feature is designed to eliminate tampering of the programmed settings. The Slimline Time Clock series have a blue back light, helping to program the units in low light levels.